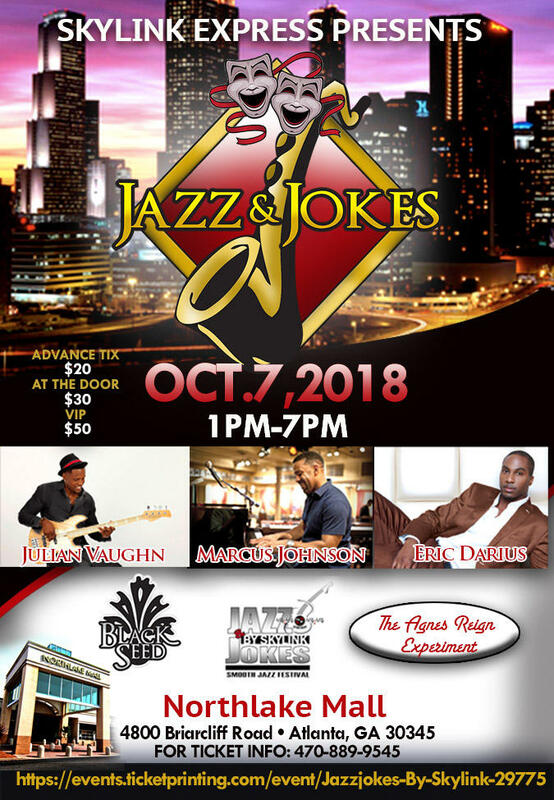 Support for Atlanta's Jazz Station 91.9 WCLK comes from Skylink Express, presenting Jazz & Jokes on Sunday, October 7 from 1pm until 7pm at Northlake Mall. Entertainment includes Julian Vaughn, Eric Darius, and Marcus Johnson, host of Catch The Flo, heard Saturdays 2pm-4pm on WCLK. Additional performers include Black Seed and the Agnes Reign Experiment. Bring your own lawn chair, food and beverages are available on site. 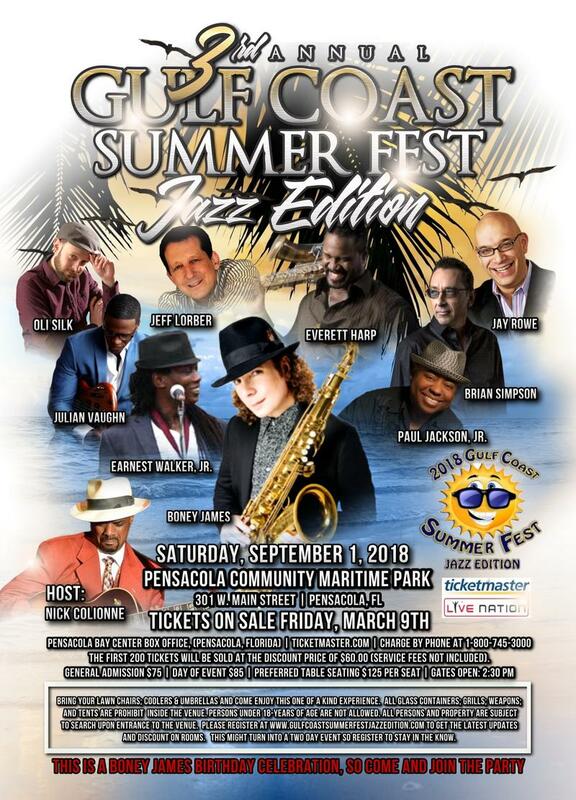 Support for Jazz 91.9 WCLK comes from the 2018 Gulf Coast Summer Fest taking place Saturday, September 1 at Pensacola Community Maritime Park. Enjoy the Gulf waters and ocean breezes as you enjoy a great day of live music including: Boney James, Host Nick Colionne, Jeff Lorber, Everett Harp, Brian Simpson, Jay Rowe, Julian Vaughn, Paul Jackson, Jr., Oli Silk and Earnest Walker, Jr. Programming on Jazz 91.9 WCLK is made possible in part by The Suite Food Lounge, home of the Suite Jazz Series. 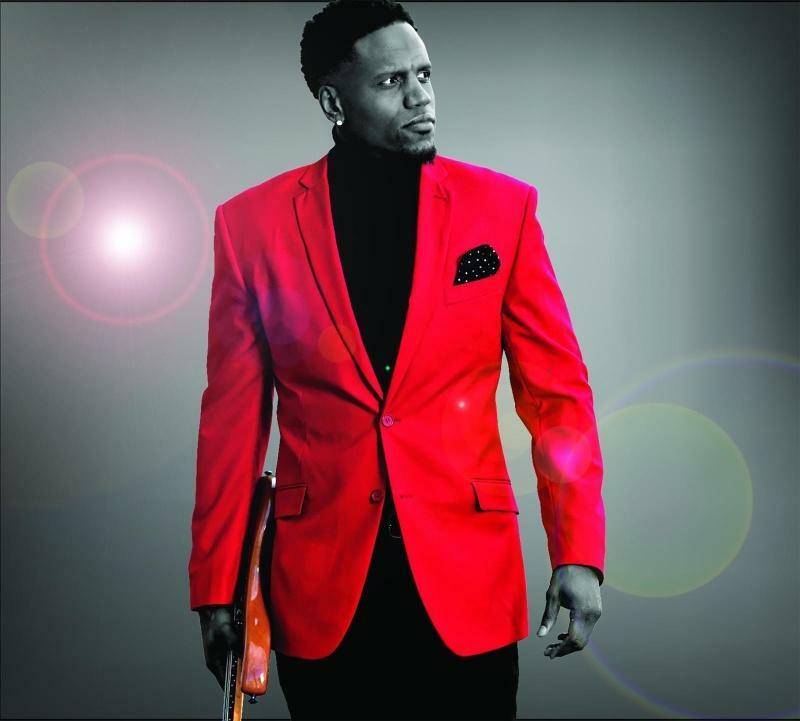 Presenting one night only March 29 Bassist Julian Vaughn along with the Suite Jazz Band. Doors open at 6:30pm, with dinner and Jazz at 7:30pm. More information about the Suite Jazz Series, including reservations, is available at 404-577-2500 or click here. The Suite Food Lounge is located at 375 Luckie Street in Downtown Atlanta. Programming on Jazz 91.9 WCLK is made possible in part by St. James Live. 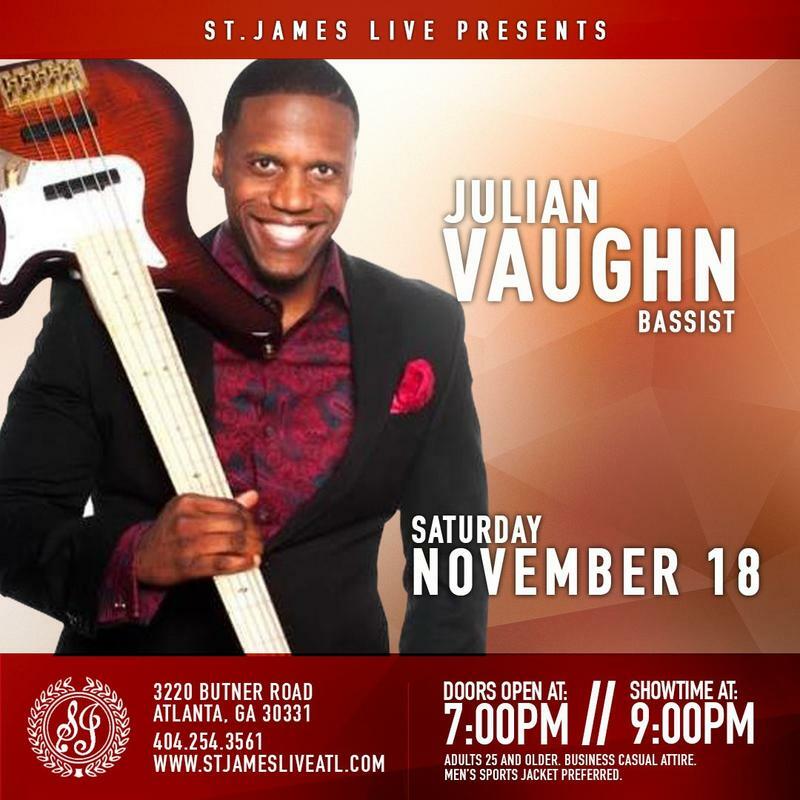 St. James Live has been providing live Jazz in South Fulton for over two years and continues that tradition with a series of Saturday evening Jazz concerts. Programming on Jazz 91.9 WCLK is sponsored in part by The Suite Food Lounge, located at 375 Luckie Street in Downtown Atlanta. Bassist Julian Vaughn's music is typified by finesse and funk, which fuels his 4th cd release Bona Fide. 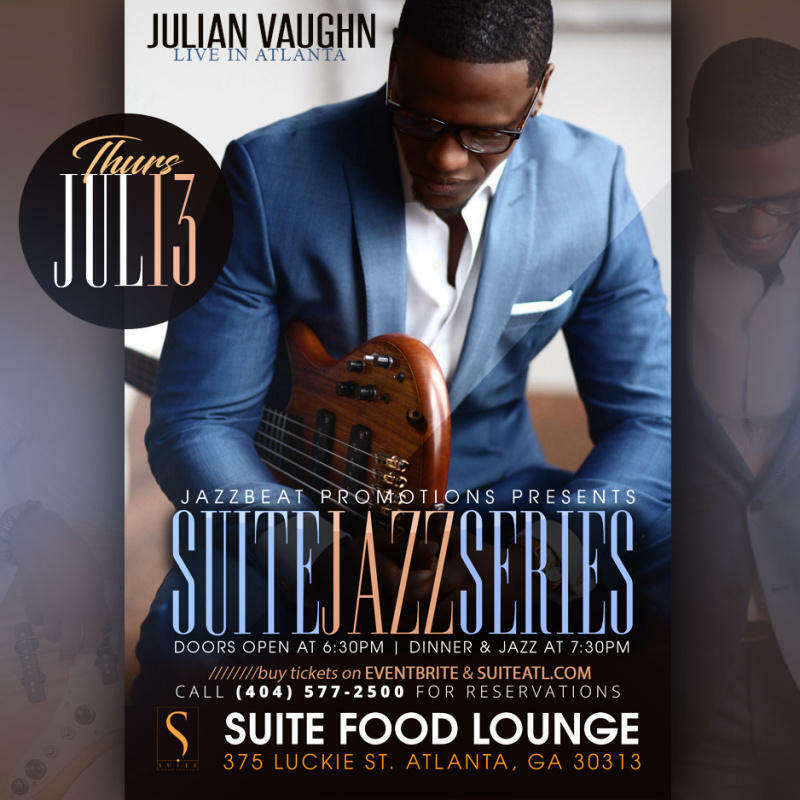 The Suite Jazz Series presents Julian Vaughn one night only Thursday, July 13, doors open at 6:30pm, with dinner and Jazz at 7:30pm. More information including reservations is available at 404-577-2500 or click here.